Sunday 8th December: RACE DAY! As expected the night before the race I only slept about 4 hours as I was restless and up thinking about the race. I got out of bed at 3:15AM (later than planned) to set about trying to get some breakfast in. Problem no.1! For some reason after my peanut butter sandwich (~250 Cal) I felt nauseous! So I couldn’t get my cliff bar, porridge or banana down (~700 Cal). This could have been because I was rushing my breakfast due to waking up 30 mins late anyway – lesson learned! (This I believe contributed to my mini “bonk” 10K into the marathon). I managed to finish my Accelerade sports drink and after a successful toilet routine headed off the lobby to catch the 4:15AM cab to the race start. Straight into T1 to do a final bike check: gears, nutrition, tires, I pulled on my wet suit sent in my street gear bag and headed down to the jetty to do a quick swim warm up and then over to see the pro’s start. It’s also important that you have your wetsuit pulled up comfortably. Lift your arm up and back down to make sure there isn’t too much tightness. Also my wetsuit has a velcro strap at the back of the neck. Make sure that this is strapped down such that it will not expose the velcro to your neck. Mine worked its way up around half way and I had a nasty strap burn on the back of my neck by the time I finished. 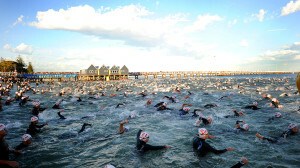 This year with 1,500 competitors instead of a deep-water start we had a beach start. 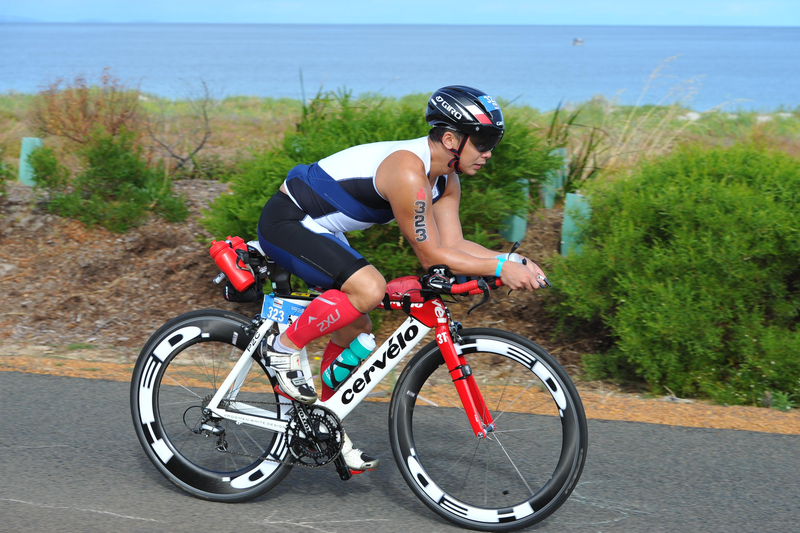 I decided to start mid pack – neither with the guys racing to the water at the front, nor the guys standing back. I also quickly checked for whoever was immediately behind me – no overly zealous or ambitious people or gigantic aussies ready to step over me – check! Now just minutes and seconds away I calmed my mind and prepared for the race. Tip! I was actually surprisingly calm at race start. Something I did almost every night in the week running up to the race was to imagine myself at the start line looking out towards the jetty getting ready to start. Pro athletes focus a lot on proper visioning and mental preparation for a race and this can help make sure that you don’t waste valuable energy being nervous/ stressed on race day as well as give you an edge in performance. In the midst of an immediate flurry of splashing and arms I quickly found myself a spot behind a similar paced swimmer and tried to get into a good rhythm. 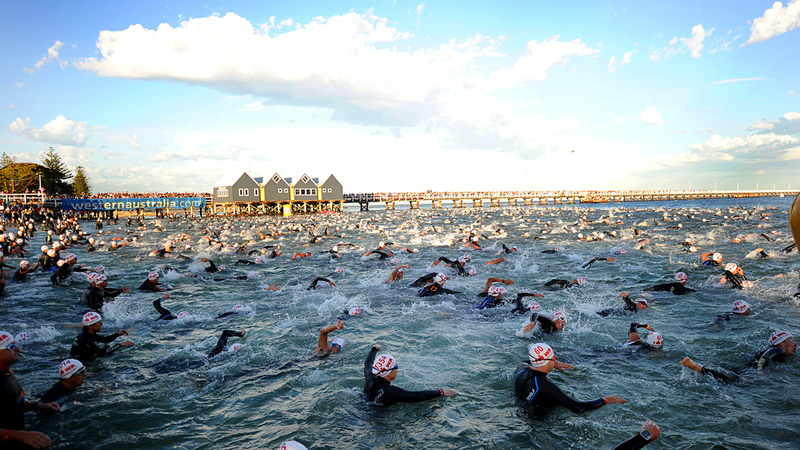 The swim is one loop around the jetty so it’s relatively easy to stay on course by sighting the jetty to the left. 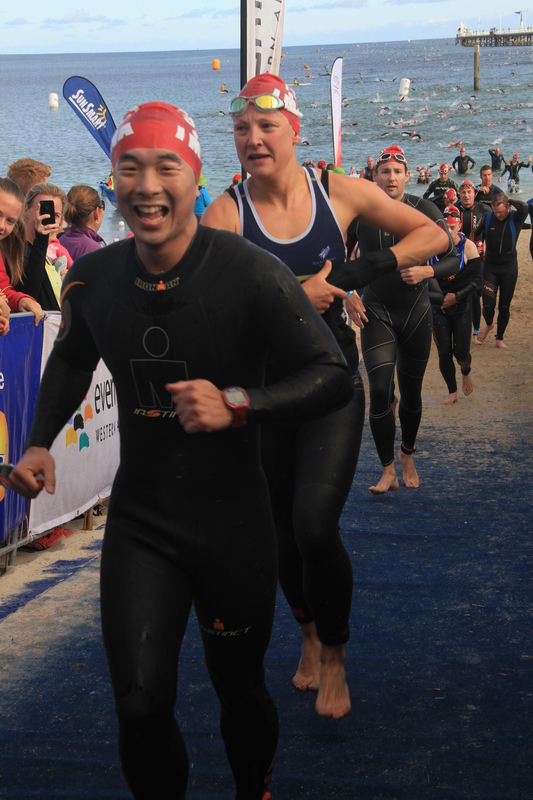 Despite there being 1,500+ swimmers everyone was well spaced out so after about 400 meters it was quite easy to find my own space in the middle of the pack. I ended up being more comfortable swimming in my own space vs. drafting another swimmer so that is something I will have to work on going forward. The swim proceeded well and at the half way mark I checked my watch and with a quick calculation was on course for a 1hr 10-15 min swim. Great – I thought to myself I’m ahead of my budgeted 1:30 estimate! Every now and then I would wonder if looking out to my left or right I’d see a shark but in fact I didn’t even see any fish swim by! Coming around the turn around we had a chance to look back to shore – all 1.8KM away but I was feeling good so attempted to pick up my pace to get back home. Eventually the black inflated IM gate came into view and a few more strokes later the swim was finished. Getting out of the water I ran up to transition where I grabbed my bag and found a spot to settle myself down for the change to bike. Transition was fairly smooth and in just under 10 minutes I was out onto the bike course. Wary of over expending too early I kept my HR under 150 bpm during the entire bike course. Early on I did feel a slight twinge in my left calf and so I popped a couple of salt tabs and the feeling went away by the last loop of the course. 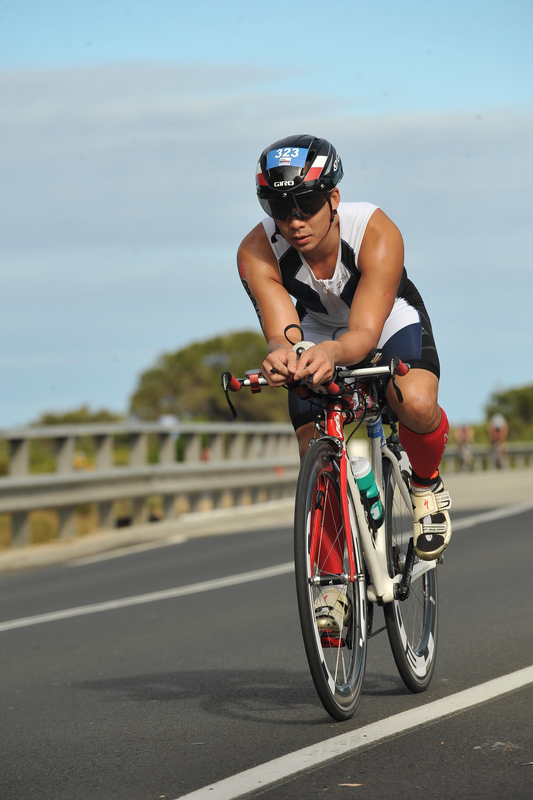 The course was a 3 loop 60KM course that took riders on out and back legs around Busselton. The ride was mostly straight and flat – which was good and bad. Good in that there were no tiring climbs or technical turns but it did mean that you had to be pedaling all the time. There were a few sections with strong cross and head/tail winds but what you got in head winds you took back in tail winds so it was fair. We had a mostly overcast day which helped with the temperature – however used to training in humid and hot temperatures I found myself needing the the toilet many more times than I planned for. In all I needed 3 pit stops on the course official porta-loos accounting for around 5-6 minutes. There were quite a few technical marshals on the course however despite the 12M drafting rule and many riders in groups I didn’t see any penalties handed out. I figured that they were less concerned about the age groupers and with an IM distance were just letting people do their race. One thing that I had to be wary of were the bottles, CO2 canisters and other items that were occasionally found strewn across the road – definitely something to watch out for! Each lap took me through the town where the streets were lined with spectators. One thing I can’t say enough about are the spectators who really get into the atmosphere of the race helping all the riders along. Even out halfway through the lap there was an outpost with people ringing bells and shouting cheers to help everyone along. As I came into the final stretch of the 3rd lap I finally spotted my family and a gorgeous poster of my son welcoming me into T2. Amazing – 2 parts down now only a marathon to go! I was still feeling great but checking my watch at 6 hours 14+ minutes the bike had taken me 15 minutes longer than I had anticipated – most likely from the wind and toilet stops I had not planned for. But also – continually in my mind was the fear of “blowing up” and as this was my first IM the over arching goal would be to just finish in a respectable time. T2 required a massive application of sun block and also filling up my running bottles with the Gu infused mixture. Once done I was out with a total transition time of 8 minutes. The marathon part of the IMWA is one of the most fun parts of the race. Running along the coast and passing the IM finish line twice on every lap is a constant reminder to get to the finish line. With bands playing, the paths lined with spectators and the hundreds of other participants you are never alone in the last leg of the race. I started out strong in the run – I completed my first 10K in just over an hour. However at KM 12 I suddenly hit a wall and all I could think of was getting something to eat and some nutrition in. My thoughts wandered back to my breakfast and whether this was the result of not getting the full breakfast in! Arriving at an aid station I grabbed a banana, two slices of watermelon and a vegemite sandwich which I stuffed into my running belt. I then decided to start a run/ walk strategy which meant doing a fast walk through each aid station allowing me to drink some water and recover before the next section. At the half way mark I also started seeing many other people walking – even those on their last lap with just a few KMs to go. With a slightly overcast sky and occasional ocean breeze the run turned out not to be to hot, this was quite a blessing compared to the previous year. On my 3rd lap my younger brother Andrew spotted me from the side line and ran a couple of kilometers with me – this was a massive boost and he was a welcome sight to see. As I turned into the final lap most people I saw were moving at a slow shuffle – but with the finish line just another 10KM away I tried to shut out the soreness in my legs and reached for the the photos of my wife and kid in my running belt. Slowly but surely I started down the last 2KM – where my youngest brother Alex spotted me and supported me with words of encouragement and got me racing to the finish line. The last few hundred meters became a blur as I swung into the finish chute between a sea of spectators towards the IM arch. Under my sunglasses my eyes immediately welled up as hundreds of images flashed in front of me from the past years worth of training to get to this finish line. “Adrian Li You – Are An Ironman” I heard as I crossed the Ironman arch to a time of 13 hours 2 minutes. Tip! : If you are not racing for a specific time try NOT to sprint into the finish line arch. Take your time to soak in the crowd and savor the moment as you complete one of the toughest one day events in the world. Also this allows for your friends and family to take videos/ pictures of you as you come in – finally it probably isn’t the safest time to push your max HR at the finale of an Ironman! So what’s next? For at least 24 hours after the event I would continue to say that the Ironman was a once in a lifetime bucket list experience. Now just 7 days later I’m researching how to get into Kona (lottery chances are about 1% or qualify by doing an Ironman in just over 9 hours). Certainly an Ironman is not a once a year undertaking for me – the amount of time, sacrifice and support from my family and friends is too demanding to do that often – at least at this stage of my life. 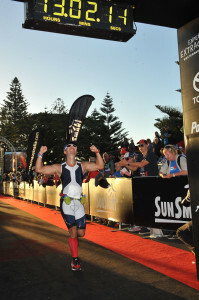 However the spirit and learnings I have from the Ironman experience will definitely have me coming back in the future. May be one day I will even get to race side by side my son Aaron in his first Ironman. 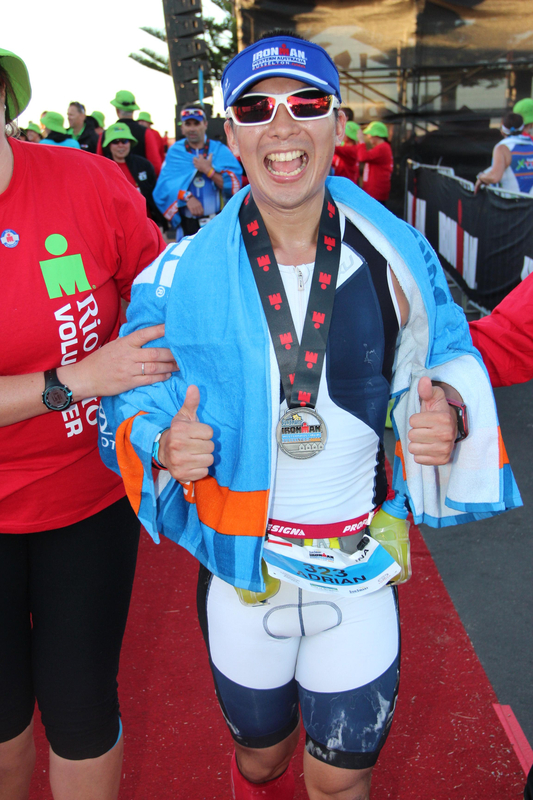 The completion of the Ironman was a culmination of a year’s long preparation and support from my family, friends, donors and colleagues. It is a hugely empowering experience and all manner of benefits from physical fitness, to more mental discipline and about what is possible when one is determined enough. However most of all it has also filled me with gratitude for life, the opportunity to even experience this and all the people who helped me make this goal possible. This has been one of the most incredible 12 months of my life from getting married to our first son, to starting a business I am passionate about to the completion of my first Ironman. 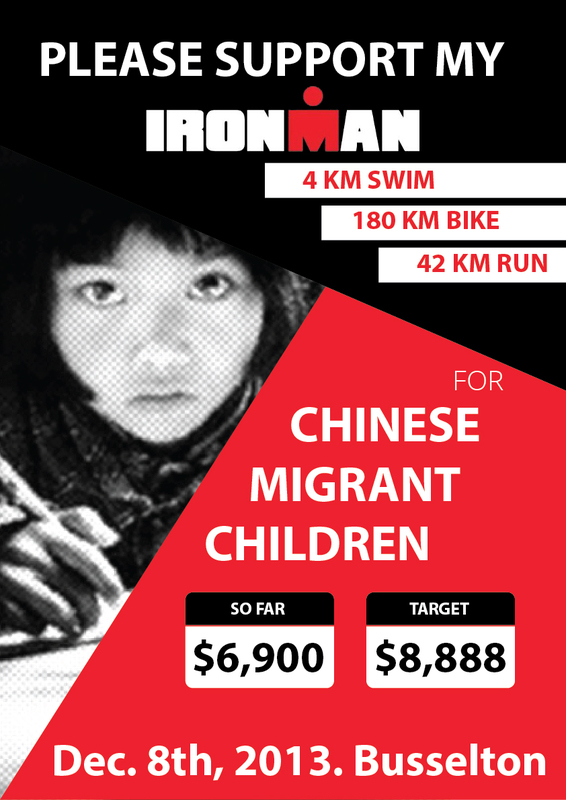 Like all great challenges in life these are overcome not by individuals but by teams – the Ironman is certainly no exception. I would never have got even to the start line without the incredible support I received. First and foremost to my wife, Vanessa, who helped me in every way from constant words of support to putting in all the extra time with Aaron as I put in the hours of training. I dedicate my finish of this race to you and Aaron and hope that it proves that I can go to the end of the world for you. Next to my family, my mum, dad and both my brothers Andrew and Alex. Thank you for the support for coming all the way down to Australia for the race and being there on this event. My co-founders and business partners Steven and Sean for allowing me to pursue this passion during our busy start up times. 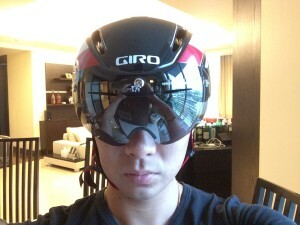 To my Heng Dai Ironman Tevis Ong. 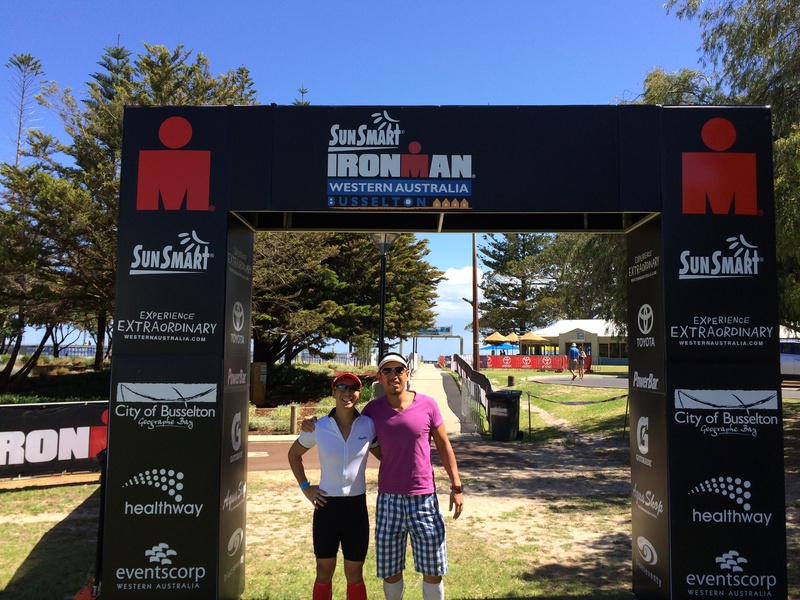 We signed up together, trained and suffered together and finished IMWA together – it was great to have a buddy throughout this year’s experience. 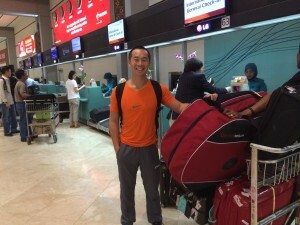 Next stop Kona! To the tribuddies family, the guys I train with and who offer their support on chat and in our group – it’s great to have this fantastic community in Jakarta to keep me motivated. To all my donors who generously donated to CNYTrust to help migrant school children. I’m excited and proud to say that together we also broke through my fund raising goal and that these funds will go a long way to support our next few years of teachers. 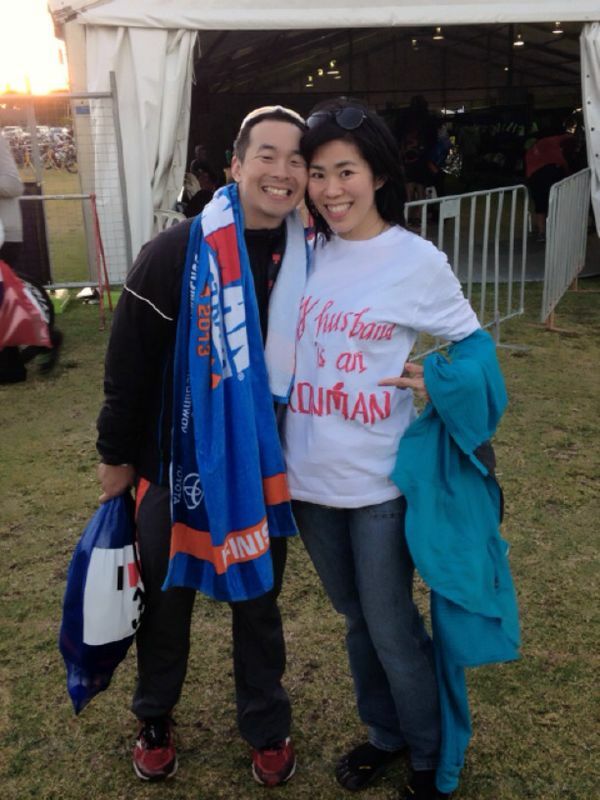 On December 8th, 2013 I completed my first Ironman at Ironman Western Australia in Busselton in 13 hours 2 minutes. The following is a detailed race report on the entire experience covering pre-race packing and preparation, a day-by-day log of activities, nutrition and packing tips and thank yous to the people who helped make this unforgettable experience possible. My race week taper included more than just reduced training but also sleeping earlier and adjusting all my toilet routines to that of race day. Hence starting with my usual Monday fast I started waking up at 3AM and eating my dinner around 4/5PM. (I also had to adjust for the 1 hour time difference between Jakarta and Western Australia). With the hard work now done to quote my MBA classmate and also fellow Ironman Geoff “Now wrap yourself in cotton wool and be ready for race day” I did my best to ensure that I slept well, ate well and avoided anyone who looked remotely sick! However to my horror, during taper week I began to *feel* strange aches and pains in my legs just from walking around! I then made sure that I wore my trainers everywhere, bought a roll of KT tape and taped up my knees and wore compression socks too. Later my Ironman high school friend Ross explained this was part of the normal pre-race nerves “creating” fictitious aches! The week rolled by and I managed to avoid any nasty bugs but also made sure I drank airborne and additional vitamin C each day. Now I just had to make sure I didn’t miss anything out from the extensive packing list I had found online and that my bike Z3D was on absolutely top form for the race! Z3D was stripped down by a bike mechanic and both tubes changed (wasn’t taking any risks with a flat). I practiced changing the tires a few times and also used a couple of CO2 cartridges to inflate the tires to check that I knew how to use them well. I did pack an extra road bike front wheel as I had heard reports of strong gusty winds just in case I had to swap out my HED Jet 6”. – TIP make sure you’ve double checked the weight allowance on your ticket because all airlines are different! 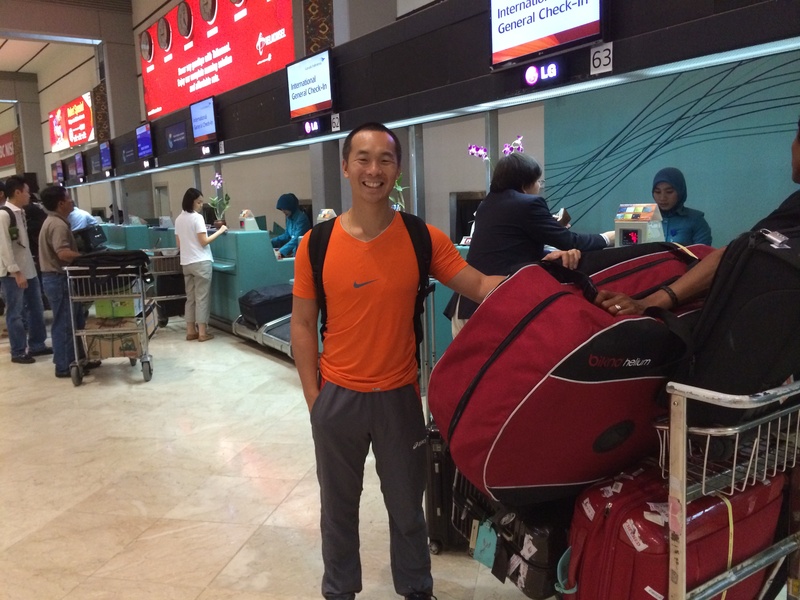 Fortunately for me Garuda provided extra allowance for sports equipment – up to 23KGs so I was fine. My friend Ross however making the trip from the UK was told he would be charged excess baggage for his totaling over US$1,000! Which resulted in him leaving his bike and picking up a rental for race day! 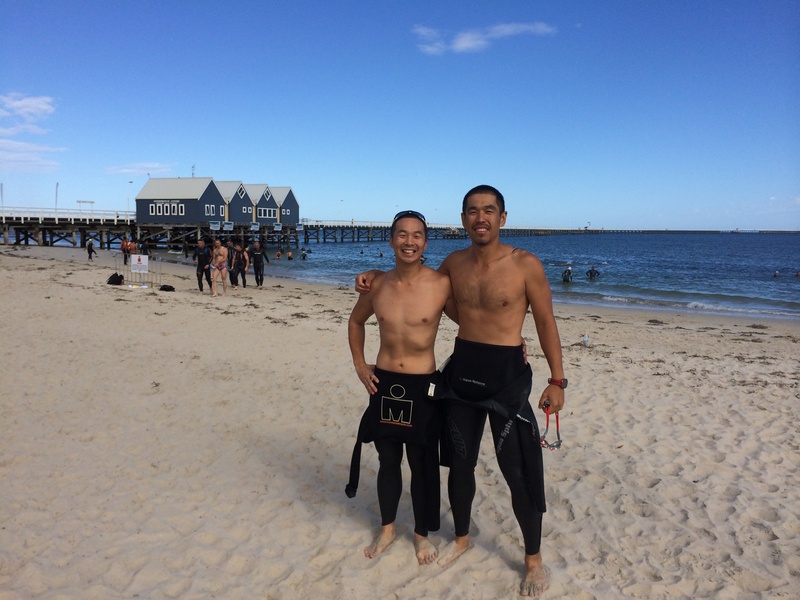 We arrived in Perth on Thursday and drove down to Busselton on the same day. Online, Hertz had the best rates and we got upgraded to a Kluger (from a Rav 4) ensuring we had plenty of space in the car for both my buddy Tevis’ bike and mine. The drive down to Busselton took about 3 hours due to the evening rush hour traffic but it was an easy and pleasant drive and so we arrived at our hotel Abbey beach Resort around 8PM that evening. The hotel was about 10 minutes drive from the race start and was a very spacious serviced apartment. However no wifi made it a little frustrating to stay in touch (which may be a good thing to help focus on the race preparations!). There did not appear to be a lot of accommodation options at Busselton and there was no official race hotel. However Abbey was affordable and with a 2 bedroom serviced apartment there was plenty of room and we could cook our last few meals in the kitchen. Overall I was quite satisfied with this choice. I did see a small hotel actually on the race course itself called Esplanade hotel – this could have been a little more convenient on race day however the rooms are likely to be much smaller I think. We were up bright and early on Friday at around 5AM (the plan was to wake up an hour earlier each day before the race). There was a swim practice on at the Jetty from 6AM – 8AM so around 7:30AM we headed off. However, by the time we arrived they said they were closing the practice! We realized soon after that we could still swim “at our own risk” – fair enough, and as there were still a few people in the sea we went off for a quick 15 minute swim. The sea was surprisingly unclear perhaps due to the wind but getting a few strokes in was a good confidence booster. Something we didn’t anticipate and had not heard about were the flies! Dec- January is apparently fly season and literally there are dozens of flies buzzing around you wherever you are! Try and get a fly net for your head to make walking around more pleasant! Finally we rounded the day off with a quick cycle (40 mins) and a 10 minute run to keep the legs loose and double check that all was functioning on the bike. On the ride we had our first real taste of the 25-30KMH winds we heard about. However I didn’t experience anything that would threaten to blow me off the bike so I stuck to my HED JET 6/9 combination for the wheels. As evening approached it was off to the race briefing for IMWA’s 10th anniversary welcome dinner. 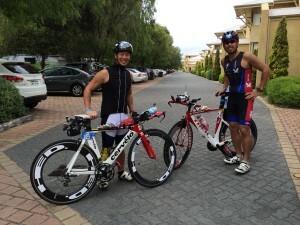 On the way over we bumped into Chris Huang a seasoned ultra marathoner and 2nd time Ironman – like Ross he also described his “gastric shutdown” on his first IM experience adding to my fears of an under practiced nutrition strategy for race day so make sure you don’t make my mistake of forgetting about nutrition plans! Fortunately everything turned out okay for me – and you’ll see a detailed breakdown of what I did later. The welcome dinner was a standard pre-IM feast of pasta, bread and fruits. After this we were treated to some well prepared videos of the history of the IMWA ironman, speeches including an interview of Andreas Raleart – all good fun except it took over 3 hours! Not ideal pre-race preparation. The race briefing didn’t happen till the end so as soon as the course descriptions were done we snuck out to get the Zzzs we surely needed. Tip! despite being blistering hot during the day the temperature drops as soon as the sun goes down so make sure if you’re still out in the evening to bring a tracksuit top. Also – my personal opinion is that the welcome dinners are not worth the AUD30+ they were charging for the non-competitors. So tell any supporters with you to dine in town while you attend the welcome dinner and briefing. Run: (1,200 Cal) 2 small bottles of water mixed with 4 Gu’s each (fruit flavored) and 4 chocolate caffeine Gu’s. During the bike I started out with a bottle of water in addition to my 3 Accelerade bottles. 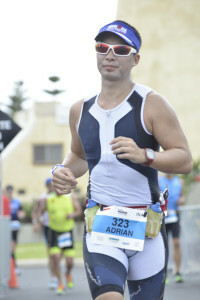 I drank only water for the first 20 mins to rehydrate from the swim and settle my stomach after which I dumped the remaining half bottle to reduce weight. Then every 10 minutes (I set the alarm on my watch at these intervals) I would take about 3 sips of Accelerade planning to finish half a bottle of the Accelerade every hour. I also ate 1 Gu just as I hit 20 minutes (remember to always take Gu with water) and then another at every half hour. I ate my cliff bars on the hours 3-4 and then the second at hours 5-6 finishing my last Gu on the home stretch of the bike. Tip! for items like Cliff bars take off the wrapper and cut into 1/4 sections to access and eat easily while on the move. I didn’t do this and it was a pain to bite off the wrapper and get equal sizes in my mouth. During the run again I sipped my Gu mixed drink every 10 minutes and planned on 1 caffeine chocolate Gu each hour. I employed a run/walk strategy between aid stations which allowed me to take a few sips of water every 2.5KM at the aid stations. After a good night’s sleep we practiced waking up at 4AM but then went back to sleep to get the extra hours in – knowing that we’d likely be restless the night before the race. We spent some time in the morning stretching and carefully packing our race bags. We had lunch at 11AM – home cooked spaghetti bolognese and dinner at 4pm (smaller bowl of the same) – be sure to reduce food intake as you get closer to the race. The biggest meal should be 2 nights before and then gradually reducing portion sizes. The day prior to the event I also like to check out the bike leg of the course so we drove the car on a single loop noting down points of interest, hills etc. Finally once we were all checked in and back home we settled down to watch a video of Kona IM 2009 where both Chrissie and Craig put on stellar Ironman performances to help with our mental preparation. Full IM transitions seem to operate a little differently to other triathlons. 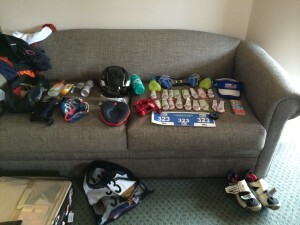 All your run and bike gear is checked in the day before and hung on railings which you pick up as you run into transition. Transition itself is in a large tent where you have a helper and also a chair to get everything on. Nothing gets left in the bike transition area – unlike in shorter distances where you leave everything you need in the morning next to your bike. This led for a much more orderly transition. That said, you must be well prepared with each of the bags as only your bike bag is available in T1 and only your run bag is available in T2. Below you’ll see the contents of my bags laid out – this was a pretty complete list here so you can check your list against what you see. Tip! when you need to dig really deep on the run try bringing something that can help motivate you to keep going. You’re not allowed any electronic equipment but anything small that is light and fits in your run bag could be a valuable mental booster when you are hurting! I brought two small laminated photos of my wife and son with some encouraging words on them – they came in hand at KM 32 as I set out on my last loop! 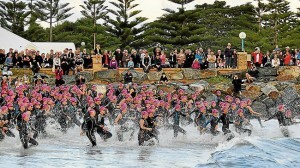 Just 1 week to go before the Busselton Ironman and my taper week has gone well. Z3D has gone to the shop and been completely cleaned up – i’ve practice the CO2 refilling and tire changes twice and so far things are going to plan. I’ve started reading blogs and other accounts of Busselton Ironman – the result has been to add to the nerves! However i’ve picked up a few tips which i’m incorporating into my last few days of preparation. 1) Sleep adaptation: the event starts at 5:45AM which is my 4:45AM in Jakarta. I’ll have to eat my breakfast about 3 hours prior which means waking up at my equivalent of 1:45AM – ergh! So this week i’ll start adapting my sleep (and eating cycle). Will target waking up at around 3-4AM each day It also means shifting my meals with breakfast at 3-4AM, lunch at around 10AM, dinner at around 4PM and then ready for bed by 8PM. 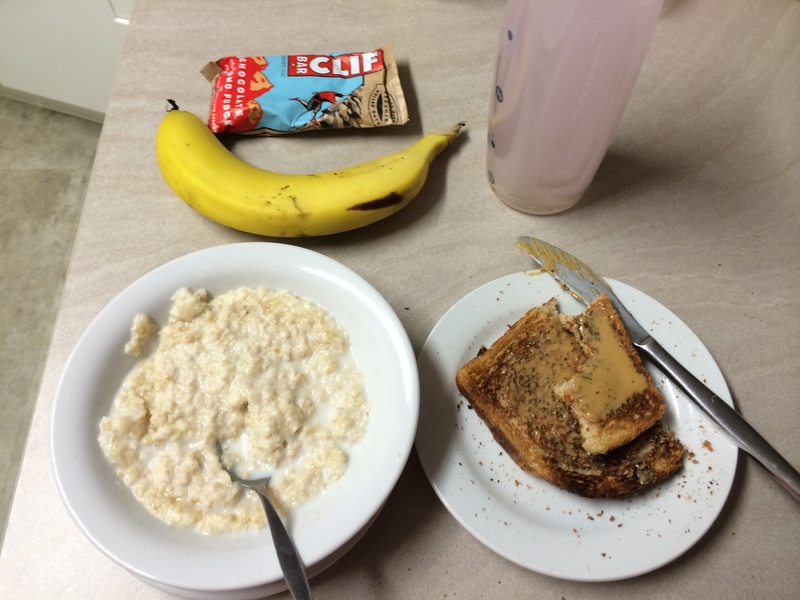 2) Breakfast: I am going to practice eating the same breakfast each morning and then proceed to a short visualisation of the race. I think doing this for 6 days prior to the race will help calm nerves with the familiarity. Finally another thank you to everyone who has donated. 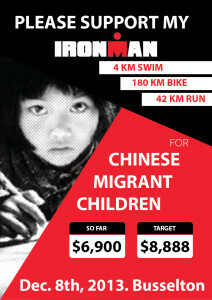 The support has been tremendous and will go a long way to helping migrant chinese students have a better future. Just two more – yes 2 more weeks!! and completed my last big build cycle before tapering down to the Busselton Ironman. The key sessions of the week were my 5 hour bike ride on Saturday and then the 3 hour run on Sunday. Unfortunately a 90 minute swim to complete the tri was missed. 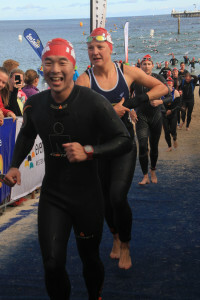 However a 75 minute swim earlier in the week in my wet suit served as a good confidence booster. That + the salt water buoyancy should give me a good boost on the day. The 5 hour bike ride on Saturday was a new first – clocking 141KM and a faster 2nd split. They’ve put a lot of new speed bumps at BSD especially at Icon making the loops there totally unattractive. However a new extended outer loop makes almost at 30KM loop. Based on my bike i think I should still be able to make an avg. 30KM/H on the cycle leg putting me at an estimated 6Hr bike. My 1KM post ride run on the day felt good and I felt strong on a 6:30-7 minute pace for the real deal. On Sunday I did a late morning 26KM run for 2 hours 57 minutes. A couple of loops of sudirman on CFD – this run was again a good confidence booster I also decided to run in my Mizunos and despite lower water drainage capacity i feel that they are the right shoes for the day. Now for the remaining 2 weeks its time to taper and make sure i’m fully glycogened up and rested for the race – it’s now the final count down!! 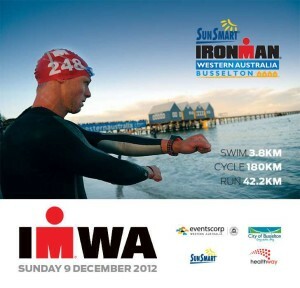 3 Weeks remaining till Busselton Ironman and the 2nd week of my last build cycle. This was a reasonable week and managed to recover from my cold the previous week by about Wednesday. With the increasing load and busy schedule at work it has been getting more difficult to squeeze all the work outs in. However I prioritized the long slow sessions and worked around the weather, traffic and did a 4.5 hour turbo session – thank goodness for Apple TV! Unfortunately the first week of my last build cycle has not gone well. For a total of around 7 hours training this week due to catching a slight cold. After doing some extensive reading online I decided that it was best to lay off training for a few days to try and recuperate. That said I’ve tried to get back into the training earlier than what some sites have recommended (taking off as many days after symptoms have disappeared as you were ill). I also decided to go ahead with my 4 hour turbo – mainly because I see the key work outs in the upcoming weeks to be the long slow rides. I woke up at 3:30AM to have breakfast and then got on my turbo watching 2 movies back to back to complete the 4 hour ride. Didn’t feel great after that ride and so had a nap later. I couldn’t resist taking my new giro helmet out for another spin the next day and did a short 45 min. ride on Surdirman cooling down with a 15 minute run. Battled with a headache all morning and now only just have got over it. I’m hoping that i’m fully recovered by tomorrow (or that my usual Monday fast and cleansing will remove the last of this bug) and so that I can have a good 2 week stretch of training before the final taper to the Ironman. With 6 Weeks to go this was a recovery week with a greatly reduced volume and a much needed chance let the muscles to rebuild. I also brought back my replacement aerobase bar which was broken from my crash 3 weeks prior. It was great to have Z3D back in action! To celebrate a return to the roads and also because of being unable to source a Specialized Evade in time for training I picked up a Giro Air Attack Shield. A perfect blend between a normal road helmet and an aero helmet the Giro AA gains much of the aero advantage from the more traditional styled bullet helmets while maintaining a semblance of acceptability for the fashion conscious! That aside for most age groupers the effect of pure aero helmets is typically negated because of inability to stay in aero position for the entire race and also because the lower ventilation can cause over heating as age groupers spend more time on the bike. 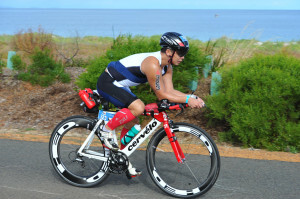 The giro AA was what Leanda Cave had worn to Ironman victory in 2012 so it has certainly proven its worth! Anyway – next week’s training returns to double digits peaking at 13 hours in 3 weeks time. Then it’s a 2 week taper down to the race! It was a tough week to squeeze in training with a trip to HK over the weekend for my son’s 100th day celebration and also my father’s Bauhina Star award. However after moving around some of the sessions I managed to stay on target. One of the highlights was my first 4 hour training ride – on a turbo trainer! 2 movies and South Park at the end really helped get me through that. 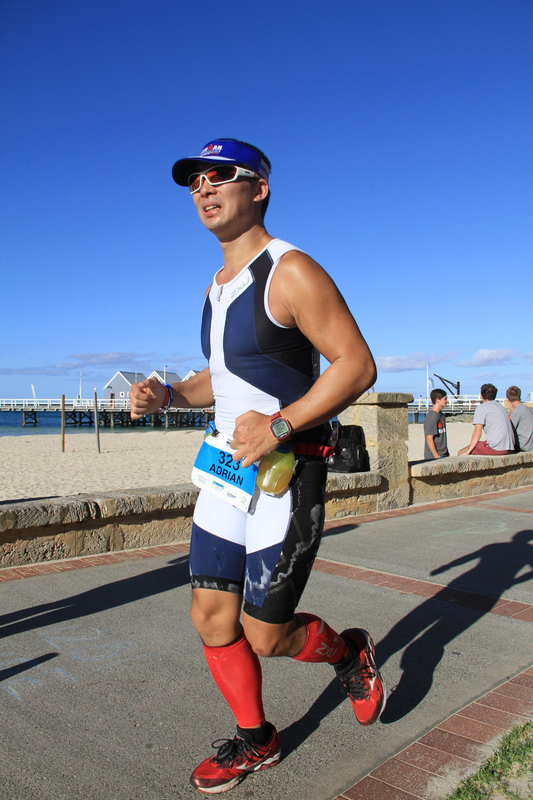 I’ve also become somewhat addicted to the Ironman Race videos – they are really inspiring – especially when you hear the stories of the people who have overcome enormous physical challenges – Cancer, amputees for example and are still attempting this race. 6 Weeks to go and next week is a recovery week before my final build cycle to the event. This was my first full week back into training after my injury and the first week of my adapted training sub 13 in 13 plan. In general i’m liking the style of the plan which is minimal and well suited for first time age groupers who are juggling family and work to complete their first Ironman. The highlight of the week was my Saturday long training which I changed into a full brick. I was with my usual training buddies Doli and Adrian however I couldn’t quite keep up with them on the bike – could be the actual effect of riding a road bike vs. my tri bike as I seemed to be averaging about 15% lower speeds compared to riding Z3D. However the 100/10/1 cycle/ run/ swim combo on the saturday was a great confidence booster so things are looking like they are on track! I’m now in my most important 8 week training to build up to my race distance. Searching online I found a famous 13 hr Ironman in under 13 hours training per week and plan to use this to guide my remaining training. After a week off from my injury I jumped right back in last weekend with 2.5Hr turbo trainer ride on Saturday followed by a 2 hour 40 minute run on Sunday. Probably not the most sensible way to get back into training and ended up with a painful right hip and a sore left knee afterwards. This could be a result of my banged up knee from the crash the prior week.